The Charlevoix, Cheboygan, Emmet Counties Public Service Communications Organization is a 501(c)(3) non-profit public service organization located in Northern Michigan and formed to train Amateur Radio volunteers to be capable of providing assistance to area professional emergency communications services, increasing the Charlevoix, Cheboygan, and Emmet Counties emergency response effectiveness, and speeding the recovery effort in the event of a communications emergency. The CCECPSCO maintains communications facilities at the emergency centers in Charlevoix, Cheboygan, and Emmet Counties, participates in emergency drills and activations, and is the "go-to" organization for RACES activites in those counties. Licensed Hams are encouraged to join, learn, and participate to advance their skills and provide a benefit back to the community. 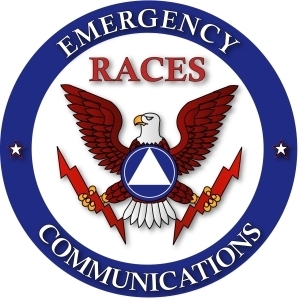 RACES is the "Radio Amateur Civil Emergency Service". The CCECPSCO is proud to be chosen by our three-county government Emergency Manager as the organization providing trained Ham Radio operators for RACES operations in his counties. RACES is activated by a state, county, or local government to provide communications in time of a civil emergency. To participate in RACES, an Amateur Radio operator must have the training and certification as required by the government body doing the activation. The CCECPSCO was formed for the purpose of organizing and training such participants and to provide other types of communications support to our three counties, our communities, and the surrounding areas in Northern Michigan. The CCECPSCO was called up by the CCE Office of Emergency Management and certain members were activated under RACES on August 4th to conduct Damage Assessment and communications in support of the major storm damage recovery in Grand Traverse and Leelenau Counties. 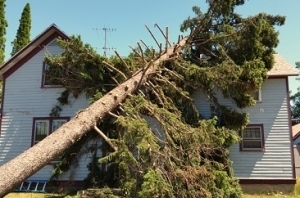 The storm that came through the area on August 2nd resulted in wide-spread damage throughout Northern Michigan. The CCECPSCO RACES activation was targeted to damage assessment in Grand Travers and Leelenau counties. Two teems of two members each worked under the direction of Greg Williams, the Charlevoix,Cheboygan, and Emmet counties Emergency Manager. The members who participated took time off work and other activities to help out. Not only do those members have the required training for activation under RACES as determined by the CCE Emergency Manager, but they have also had damage assessment training. Members who participated included Chuck Brew N8NXP, Chuck Scott N8DNX, Gary Williams WB8MWR, and Rick Jersey KC8TU. The CCECPSCO would like to thank our Emergency Manager Greg Williams and his assistant Megan Anderson for providing arrangements and guidance and also those at the Leelenau County 911 center who went out of their way to provide a range of maps and information for use in the Glen Arbor Area. Gary WB8MWR and Chuck N8DNX adjusting the actuator. 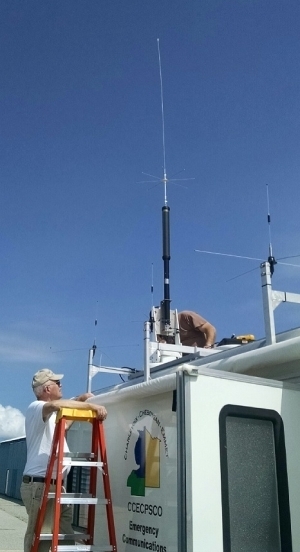 * On Saturday, August 8th, CCECPSCO members installed the new Tarheel "screwdriver" antenna on top of the communications trailer. The antenna is mounted to a repurposed satellite antenna mount to provide motorized deployment and storage of the antenna. In the standard configuration the antenna includes the motorized coil section, a short mast, a capacity hat, and a large whip. Other whip configurations have been donated to provide better operation on both lower and higher bands. The antenna can be set to any angle from stored horizontally through straight up and on to 45 degrees over the back of the trailer to provide for NVIS operations (full regional coverage). Remaining work to complete is extension of the antenna control and coax cables that have already been run to just inside the trailer, and final installation of custom controls for the elevation actuator and antenna adjustment. Members attending were Mike W8VPC, Ron W8DR, Gary WB8MWR, Chuck N8NXP, and Chuck N8DNX.